Its incredible how quickly a small area of clutter can turn into cupboard or room sized mountain that can take some time to deal with. Finding space can seem impossible at times. 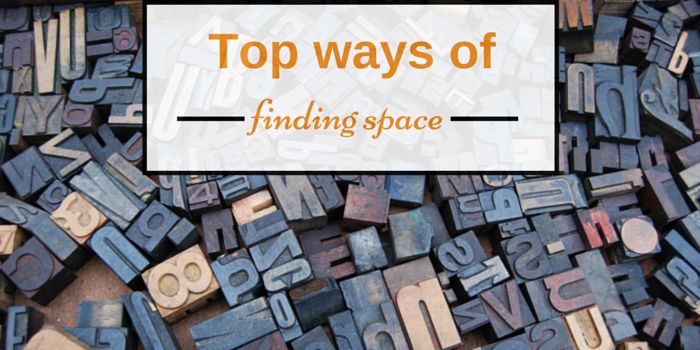 Most times all you need to do to find space is reorganise. Here, we offer some tips on keeping your home clutter free. Everyone is a hoarder to some degree and the first thing you want to figure out is which degree applies to you. Chances are close to half of the items that are taking up space in your home are things you have never and will never use. A good rule of thumb to follow when determining whether you have items that can be parted with is asking yourself when the last time you used or thought of said item was. Most professional organisers will tell you that anything that has been untouched for more than 6 months needs to go. Re-organising will not only free up space, it can be a profitable and even charitable endeavour as well. The Internet has made selling ones unused items super easy. Using sites like eBay is great for high-end items, but things like toys and clothing can be sold on local based Facebook pages. If that doesn’t appeal to you but the thought of tossing perfectly good unused clothing away makes you cringe then donate it, some charities will even come to your home to pick the items up. If the size of your home is not able to accommodate the amount of stuff you have on hand, whether you have a home based business with a growing inventory or your children are engaged in numerous sporting activities, requiring heaps of equipment, then you may want to consider storage; especially if buying a bigger home is financially out of the question. Renting a storage space is a great way to free up space in your own home. Aside from storing things like inventory or equipment they are a great option for storing your seasonal items as well. Christmas decorations alone can easily fill up a closet or small room. Outdoor patio furniture looks fantastic on your patio or backyard in the summer months but it is nothing more than a space-hogging eyesore in your shed or garage for the rest of the year. Instead place these occasionally used items in a storage facility for a small monthly fee.